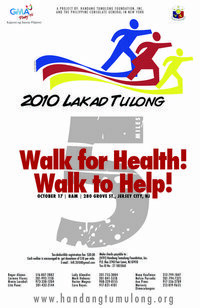 One of the organizations I volunteer for Handang Tumulong Foundation will be holding its second annual walkathon fundraiser, LAKAD TULONG, in Jersey City, NJ this Sunday. In partnership with the Philippine Consulate General in New York, the foundation will coordinate this year’s event under a dual focus with the theme, “Walk for health, walk to help.” Not only will participants walk and raise money to help communities and families in the event of another disaster in the Philippines, but they will also embody the importance of health and fitness in this effort. I’ll be there bright and early, working one of the tables. More information can be found on the Handang Tumulong Foundation website. I’ll be playing a Halloween show with EM at Parkside Lounge at 9PM on Fri, Oct. 29th. 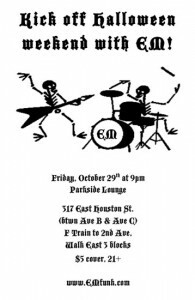 Come in costume and get funky! Just $5 and plenty of funk. 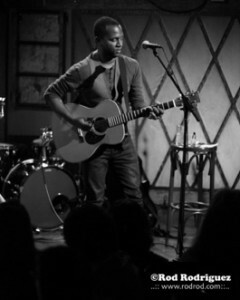 David Ryan Harris played Rockwood Music Hall this past Sunday night. It was pretty much a solo show. He took advantage of a looper to fill up some of the space and for one song he brought up a guest to play the cajon. This was the first time I saw him live other than seeing him with John Mayer this past February. It was also the first time I saw an act on Stage 2 of Rockwood. I’ve dropped in before but haven’t stayed for a full act. He really puts on a great show and gets the crowd involved. The sound in that room is also great. I would definitely recommend seeing him. Rockwood in general is not an easy place to shoot. The lights are low and it can get crowded. When I arrived at Rockwood DRH was already playing and the room was pretty full. I ended watching him near the entrance of the doorway. The good thing about this spot is that it is elevated. The bad thing is that the light is even lower and everyone bumps into you. I first started shooting in color but wasn’t really getting any good shots. I started with ISO1600 and tried ISO3200 still nothing. I decided then to go black and white and got some decent shots for being in one spot. For lenses I used both my 17-55mm and my 50mm. I brought my 35mm but was too far away to take advantage of it. For video I first tried my 7D but found it to heavy to hold still for long periods of time and it was eating up lots of my memory. I ended using my SD940 which worked out well. I used the railing near the door to help keep my hands from shaking. I’ve finally found some time to update the site. Look around and let me know what you think.